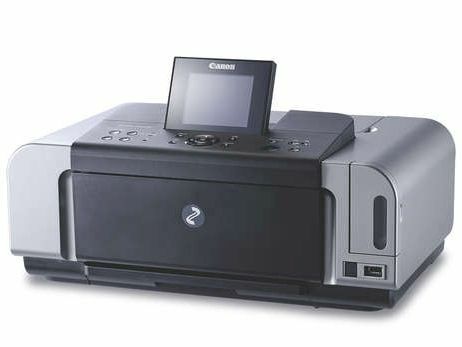 The Canon PIXMA iP6600D is a smart and professional looking printer. Styled in silver and black and about the size of a hi-fi amplifier, it has two ways of feeding paper. There's a paper feed tray at the back, which can take up to 150 sheets at a time. A separate pull-out cartridge, which slides in underneath, can be stocked with another 150 sheets of paper up to A4, but is probably most likely to be used for 15x10cm photo blanks. A telescopic output tray pulls out from the front. The control panel, set in the top of the printer, includes a large, 90mm LCD display, which is big enough for sensible previews of photo prints and for navigating the printer's menu system; a well-laid out control panel makes this very easy. On the right-hand side of the front panel is a hinged cover, which reveals sockets for all the major memory card types. Below this is a PictBridge port for direct connection of a digital camera. The main connection to your Mac is a single USB 2.0 port at the back of the printer. Prints are clean and well detailed, with colours coming across looking natural, but vivid when needed. Text and graphic print on plain paper is also pretty good, though there's a little fuzz round the edges of black text. The iP6600D, like its little sibling, can print double- sided as standard. Print speed for 15x10cm photos is very reasonable, at just over a minute in high quality and just under in standard mode. Printing on plain paper takes a lot longer, though, with our five-page text print coming in at 1 min 30 secs, and the mixed text and colour graphics taking a hefty 2 mins 21. Page costs aren't easy to calculate, as it depends very much what you're printing, but we reckon around 1.4p for a 5% text page and 5.8p for 20% colour.